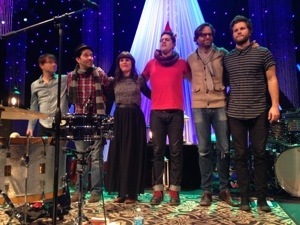 Sunday night I had the wonderful experience of attending the Jars of Clay Inland and Christmas concert in Waukesha. Most people know I’m a huge fan of Jars. They were the main musical influence while I was starting my spiritual journey and truly understanding what it means to follow Jesus (I’m still on that journey of understanding). Since those formative years, Jars have recorded some fantastic Christmas songs and I’ve been able to get to know the guys thanks to the wonderful world of Twitter and a few local shows. This culminated Sunday night and became one of my favorite holiday celebrations of all-time. The night started when Charlie and Steve finished up their soundcheck and joined me for a beer. They brought Cara (cello player) and Jude (Steve’s wife) and we had a wonderful time. To see them at a show on stage and to see them after the show in person is one thing (two I guess;). But to sit with no one else around and enjoy conversation without distractions was a pretty special experience. I appreciate their candidness and the real life moments we have in common. I talked with Charlie more than Steve because Steve had another conversation going on (see next segment). Charlie is one of the most genuine people I’ve ever known. We talked about some of their experiences releasing Inland this fall and what might be next for the band. They looked to me for beer selection. That was fun because the bar had Fat Squirrel (New Glarus, WI) and the guys tried and enjoyed that. Steve took a pic of the bottle to save for later. I’d like to think that if I lived in Nashville, we’d meet for beers a few times a year. For now, I’m happy that when they are touring through Madison or Milwaukee I get to lift glasses together with them. We met at People’s Park, and because of some technical glitches in the soundcheck, I beat the guys to the tavern. When they walked in, I greeted them all but Steve was quickly in conversation with the bartender. As I’m saying hello to Charlie, Steve hits me and says, “Come on, Hans put you up to this!” Not wanting to be rude, I kind of dismissed the comment because he and the bartender were clearly into a deeper conversation and I was still welcoming Charlie and meeting Cara and Jude. But as I looked at the bartender, he looks over at Charlie and with wide eyes and a huge smile says “Charlie Lowell!” This was weird. I never guessed the guys would be recognized by the bartender at People’s Park. The bartender’s name was Phil and he had 101 questions for the guys. He was fortunate that the bar was pretty slow, so he took the opportunity to come out to our table. He went on to say that he listened to Jars extensively but he’s missed the last few albums. He asked about the writing process. He praised Worlds Apart. He was a kid in a candy store, and that was fun to watch. The story gets better. After Charlie and Steve had to get going, Katie and I had dinner there. As we were ordering Phil walked over and said he hoped he didn’t interrupt our time this afternoon. Of course I said “no problem at all.” He went on to say that he’s definitely going to try to make it to the show. I gave him my cell and said if he goes, I’ll get him tickets. Charlie had offered me tickets but I already had mine. I didn’t tell him the tickets were courtesy of Jars of Clay. At the show, half way through the opener (John Mark McMillan), I got a text from Phil that he was on his way. I texted Charlie and he had two tickets waiting at will call for Phil, the bartender from People’s Park. I think it’s fair to say that Jars of Clay is more comfortable playing in bars and clubs than in churches. I know for a fact that they want to play in venues where people like Phil feel comfortable. In Dan’s words, there’s room for everyone at the table. I don’t know about Phil’s background or spiritual journey, I don’t even know if he’s on a spiritual journey. But Charlie, Dan, Steve and Matt not only set the venue for any walk of faith to feel comfortable, they put tickets at will call for the Phil’s of the world. What a blessing to be a part of getting Phil to this show. At one point, Dan was winding down the show and a woman yelled out for a song that no one could quite understand. Steve asked for her to repeat, and it still wasn’t loud enough. On the third try, we heard, “Art in Me.” I smiled because I knew there was a tricky guitar solo at the beginning of that song, but as my head was turning from the lady who made the request to the stage, Steve was already looking at Dan and Matt with optimism, and into his mic, he said “fair enough.” He immediately began retuning his guitar. Professionals in action. Dan started talking a bit about the song I think. I don’t know because I was fixated on Steve getting ready to play. Not sure how many Jars shows I’ve seen, but I’m fairly certain I’ve never heard Art in Me live. Tonight, front row seat to greatness. It was so rushed and on the fly, that Steve didn’t get the message to Matt that he was playing in a dropped key. So when Matt came in, Steve had to wave him off and yell “dropped” to get them on the same page. Does that take away from the professionalism? Not in the least. Bands have songs they just don’t play live. This song must not have seen a live show in years. Yet they pulled it off beautifully. When Steve went into the opening guitar solo, the crowd should’ve gone crazy. I appreciated the effort, and clapped and hollered as much as I could without distracting attention from the geniuses on stage. Earlier at the bar, Phil’s biggest question was how did they create Worlds Apart. Phil and I were on the same page here. A couple songs are giving this classic a run for it’s money, but I doubt any song will overtake this one’s place as my all-time favorite. They were talking cords and clearly Phil has played it on guitar before. I chimed in that I, too, know this song well: “Just E, A, and B” to which both Charlie and Steve (smiling) said, “whoa, whoa, whoa. Take it easy, those were simpler times.” For a song that is so powerful both lyrically and musically, it’s rather simple to play. And when you learn an easier way to play those three chords on a simple slide down the fret, it’s an absolute joy to play. But I sensed an interesting observation here, and it repeated itself later at the show. When Art in Me was requested, one of the guys made the comment that it was written during a simpler time for Jars. There was a guitar solo which may make the song seem more difficult, but I’m guessing that it’s a simpler song for the guys. I’m no pro, but I know a bit of guitar. And twice tonight the guys had made a comment, almost a disclaimer, that some songs were written “in simpler times.” I think it’s interesting how the musicians get defensive about the technical aspect of the songs, yet the audience is still wonderfully connected and affected by the same notes and words. 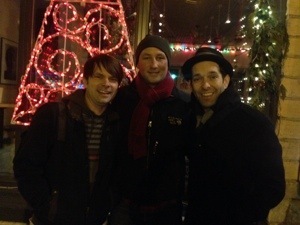 If you get a chance, check out the music of Jars of Clay. Almost 20 years in the music industry, these four men are at the top of their game. Inland, their latest record, is quickly becoming my favorite. 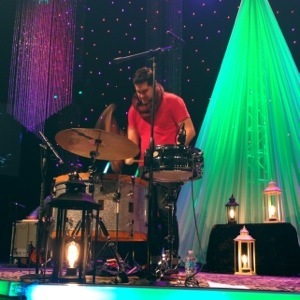 Their Christmas show is an absolute treat (you can read my three-part series on Little Drummer Boy from last year). They practice what they preach: there is room for everyone at the table. This entry was posted in Life on December 21, 2013 by Hans Schiefelbein.